Our large selection of dining room tables, chairs and servers represents a wide range of styles including formal, elegant, contemporary, casual and country. The cornerstone of every dining room is the dining table and chairs. Whether you're looking to furnish for casual eating or formal entertaining, Westchester House & Home has a design to suit your taste. A coordinated dining room set brings together a dining table and chairs along with accessory pieces like china cabinets, buffets and servers to make a bold design statement. At Westchester House & Home, you'll find our showroom brimming with innovative design ideas for your dining room furniture. The latest trend in dining room furniture is the bistro dining set. Perfect for an intimate setting, a bistro dining set can reflect your personal style, or simulate a Paris café. Visit the Westchester House & Home design showroom in Mount Kisco to see the newest in bistro dining furniture. A formal dining room needs to be functional, as well as beautiful. At Westchester House & Home, we offer service pieces including lighted china cabinets, buffets, sideboards and servers in a variety of design styles. Westchester House & Home will help you furnish your dining room. Our complimentary interior design service will make it enjoyable for you to find the right look that reflects your lifestyle. 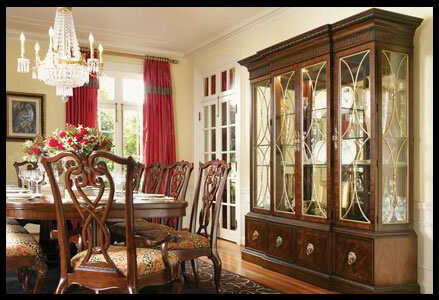 Westchester House & Home is your destination for Dining Room Furniture. Our Mount Kisco showroom is filled with all types and styles of dining room furniture to meet your decorating needs.